A light, fun, and dynamic story set in the 1920s, particularly recommended to those with an adventurous and playful spirit. I have been a follower of the author’s blog for several years, although I was not following her when she wrote this serial. 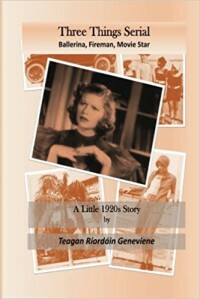 Teagan Geneviene is a fascinating and versatile writer. I have read her novel Atonement, Tennessee (check my review here) that is a magical experience, full of finesse, beauty, and attention to detail, evidently the fruit of a lot of thought, careful planning, research, and revision. On the other hand, she is also able to produce her legendary serials. She starts with an idea, or an image, and asks the readers of her blog to contribute certain elements. These might be things (objects, words, concepts), foods, words related to a certain era… She links each one of the posts to the blog of the contributor, and progressively builds up her story, going wherever the three things (foods, objects, or whatevers) and her imagination take her. Although, as I’ve said before, I wasn’t following the author’s blog when she wrote this serial, I have met the main character, Pip in a later serial and I have followed several others, some with familiar characters and a recent one with different characters, and more in the steampunk style. Unsurprisingly, they have a big following and the authors keeps her followers (and I suspect, herself) guessing where the story is going to go next.